Is the popular Tech ETF (QQQ) forming a “Head & Shoulders” topping pattern? Low odds, yet possible! 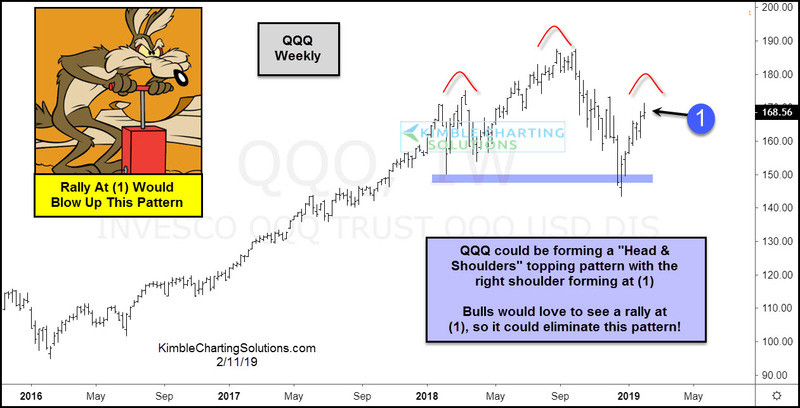 What would it take to eliminate that this pattern is sending a bearish message to the tech sector? A strong rally at (1), would blow up the likelihood that tech is topping here. 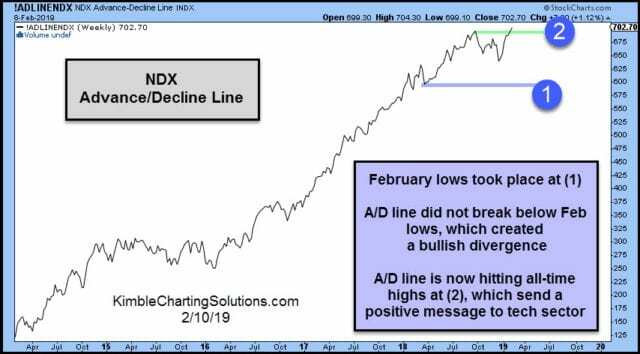 The NDX Adv/Dec line did not break below the February lows, while the NDX 100 index did. This created a short-term bullish divergence. Of late the A/D line is breaking out to new all-time highs at (2), which sends a positive message to the Tech Sector. With the A/D line breaking to new highs, a rally at (1) in the top chart would greatly reduce the odds that an important topping pattern is in play. Tech bulls should keep a very close eye on what this key sector does the next couple of weeks! This entry was posted on Monday, February 11th, 2019 at 9:17 am and is filed under Chart School, Immediately available to public. You can leave a response, or trackback from your own site.